The V-53 was one of several vessel designs based on the popular V-30 class of cruiser. 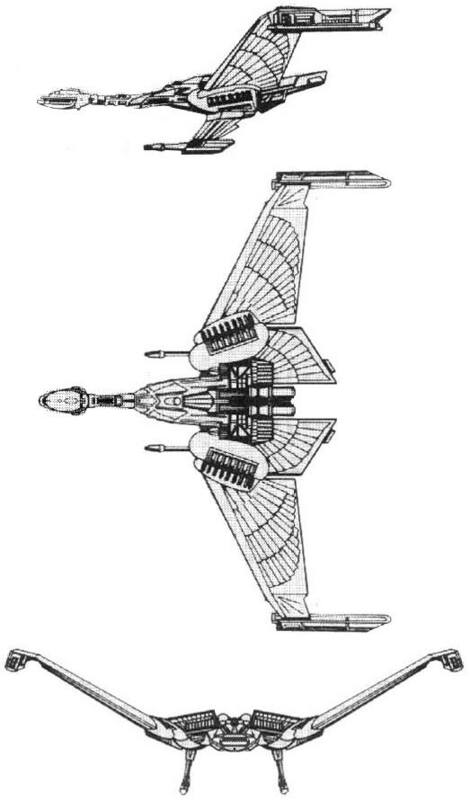 Know for their distinctive bird-like design, the V-53 have become a popular exploration cruiser for the Romulan Star Empire and a often seen in unexplored space throughout the Alpha and Beta quadrants. The V-53 is listed as a light cruiser, but is most often noted for a scout cruiser role. The class had several specialized sensor bays that allow for different configurations of primary and secondary sensors. Multiple cargo bays and extensive replication systems also allow the V-53 to operate for extended periods away from main-line support. Like its cousins, the V-53 also has a wide range of secondary system found in duplicate throughout the massive wings. This give the class excellent resiliency if combat and in it’s exploration duties. Oddly enough, although the V-53 is the largest of the Winged Defender variants, it is also the lightest. Launched in 2306, the Type-1 uses the RWF power plant which provides slightly less power than the traditional RWG system, but give the class extended range by using less overall fuel. To compensate for some of the power reduction, designers used the RIG-1 impulse system giving the vessel main power equal to it’s older cousin. The overall design was solid and the V-53 became well established in it’s front line role. Despite it’s capabilities, the decision was made to upgrade the V-53 in 2353. The Type-2 saw the replacement of the main warp drive to the RWJ system. The RWJ-1 produced significantly more power than the older RWF drive, but was slower than the less powerful system. However, the RWJ-1 could maintain its emergency speed for three time as long as the RWF-3. This allowed the V-53 Type-2 to cover greater distances. The V-53 was soon known as the “backup” often being the first vessel to be able to respond to trouble along the frontiers. The V-53 was well known for arriving at the site of an engagement just as the tide of battle was turning. With the V-53’s firepower, the engagement would often swing back in favor of the Romulans and the enemy vessels were forced to withdraw or were destroyed. A total of 60 V-53’s have been built. 2 Type-1’s and 1 Type-2 have been lost, 1 Type-1 has been destroyed and 1 Type-2 has been scrapped. 57 Type-1’s were converted to Type-2’s. 55 remain in active service. The class is named for the Romulan Arrenhe Slenov, a martial combat form popular among Romulan farmers and fieldworkers. The class is known to Star Fleet as the Swan in deference to it’s Terran swan-like appearance. Power Units Available – 22 ea. 30 ea.